Figure 2.18. 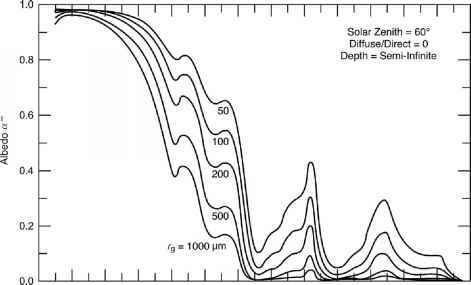 Effect of soot concentration on albedo (from Warren and Wiscombe, 1980, copyright 1980 American Meteorological Society). also on the spectral distribution of the incoming radiation. Over large snow-covered areas, albedo also depends on vegetation and surface roughness. Figure 2.19. Semi-infinite direct albedo as a function of wavelength for various grain radii (from Wiscombe and Warren, 1980, copyright 1980 American Meteorological Society). can stay constant and sometimes even increase because of the transformation of surface snow into faceted crystals or because of the formation of surface hoar. a = min (0.94, 0.96 - 1.58^^), P = max (0.04, 0.0192^/7^) for 0.3 < X < 0.8 ^m, a = 0.95 - 15 A^d^, P = max(1.0, 0.1098pJ jd^) for 0.8 < X < 1.5 ^m, a = 0.88 + 346.3dopt - 32.31-7^, P = +co for 1.5 < X < 2.8 ^m, where X is the wavelength, a is the albedo in the considered band, P is the coefficient of absorption expressed in cm-1, and dopt is the optical grain size expressed in m, which depends on the grain size and on its shape. The effect of impurities on the albedo is calculated from the age of the snow surface. Table 2.6 gives the values of the albedo and the coefficient of absorption for the main snow types neglecting impurities. Table 2.6 Reflectance and absorption coefficients of typical snow samples from the main classes integrated over three spectral bands. Effect of spectral distribution on the albedo Since snow reflectance drops from almost 1 to 0 between 0.3 |~im and 2.8 |^m, snow albedo of a given snow layer is strongly affected by the spectral distribution of incoming solar radiation. This distribution varies a lot according to cloudiness and to the relative contribution of direct radiation and clear-sky diffuse radiation. The spectrum of clear-sky diffuse radiation is focused in the visible part where clean snow always shows a high reflectance. Only a few models take into account this distribution to calculate snow albedo. Snow cover is often heterogeneous and the albedo of a snow-covered surface differs from that of a point snowpack. Except over large ice sheets (Greenland and Antarctica), the albedo of large surfaces is generally much lower than the albedo of the snow covering these surfaces. The main causes for this decrease are given below. • A patchy snow cover. Because of snow drift and local variations in snowmelt, snow cover is frequently patchy, especially during the melting period. Parameterizations of albedo in climate models take this effect into account by considering that only a part of a considered surface is effectively covered by snow. The ratio of snow-covered surface to the total surface is generally deduced from the average snow depth. • Vegetation. Interception of radiation by vegetation strongly alters the albedo of snow-covered regions such as the boreal forest. This alteration depends on the type and density of vegetation, on snow deposition on the canopy, and on the incidence of incoming radiation. Most parameterizations of snow albedo in climate models take this effect into account. • Surface roughness has similar effects as vegetation but at different scales. This is the case for high mountains as well as for smaller relief such as sastruggi. Summer melting on polar sea ice can also lead to significant variability in albedo, with values running from between 0.1 for deep melt ponds to 0.65 for bare, white ice, when all the snow has melted (Perovich et al., 2002). In the thermal spectrum (5-40 |~im), snow behaves almost as a perfect black body (Dozier and Warren, 1982; Warren, 1982). 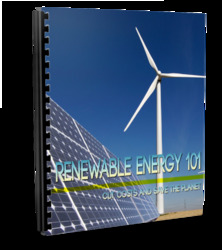 This means that it absorbs all the longwave radiation emitted by the atmosphere or by the surrounding obstacles and emits the maximum thermal radiation allowed by its surface temperature. Longwave radiation is completely absorbed in the first millimeter of snow. This property comes from the high emissivity of ice (approximately 0.97) (Hobbs, 1974). The hemispherically averaged snow emissivity is around 0.98. Directional emissivity decreases slightly with lower viewing angle. The high emissivity of snow, combined with its high reflectance in the shortwave spectrum, plays a major role in the earth's climate and in the large part accounts for the rapid cooling of continental regions in winter. The partial transparency of snow in the shortwave spectrum and its high emissivity in the longwave spectrum induces an unusual phenomenon: subsurface heating (Brun et al., 1989; Colbeck, 1989b; Koh and Jordan, 1995). This phenomenon typically occurs under clear-sky conditions and at relatively cold temperatures, when a surface fresh snow layer is submitted to solar radiation. In such conditions, net longwave radiation losses at the surface are only partially balanced by surface absorption of shortwave radiation. A few centimeters below the surface, snow continues to absorb solar radiation transmitted by the upper layers. This absorption warms a subsurface snow layer until it is balanced by conductive losses to the upper and lower layers. This phenomenon is similar to a greenhouse effect. In some cases, absorption is sufficiently large or conduction sufficiently weak for snow a few centimeters below the surface to reach the melting point, despite surface temperatures that remain a few degrees below 0 ° C. If this phenomenon is followed by a nocturnal cooling, it forms a melt-freeze crust (class 9e) below the surface while the surface remains powder-like. Snow consists of particles of ice that form in the clouds, grow initially by vapor deposition, and then reach the ground without evaporating or melting. Conditions for snow to form include atmospheric temperatures less than 0 °C and the presence of supercooled water. Snow begins as ice crystals, which nucleate either homogeneously or heterogeneously onto the surfaces of ice nuclei. The basic shape common to all ice crystals is a hexagonal prism with two basal planes and six prism planes. The relative growth rates of the faces vary with temperature and supersaturation, giving rise to a wide variety of crystal shapes. When an ice crystal grows to a size where it has a significant downward velocity, it becomes a snow crystal. Larger snow crystals continue growing by accretion (riming) or by aggregation into snowflakes. Snow thus consists of an intricate variety of snow crystals, as well as rimed and aggregate versions of these forms. After being deposited on the ground or on a previous snow layer, snow crystals accumulate and give birth to a new snow layer. Snowfall amounts are measured both by depth and by snow water equivalent depth or SWE, which is the depth of the snow if it were melted. Typical snowfall rates are 1 cm h-1 of depth or 0.8 mm h-1 of SWE. The density of newly fallen snow is typically between 60 and 120 kg m-3 for dry snow falling in low to moderate winds, but wet or wind-blown snow can reach densities of 400 kg m-3. Current functions that predict new-snow density from temperature and wind speed alone give uncertain results and can be improved by taking crystal type and size into account. Such functions, for instance, frequently underpredict the density of polar snow, which is usually assumed to be around 300 kg m-3. Snow drift, metamorphic settlement, and slow deformation from overburden stress compact the snow cover over time. Once on the ground, deposited snow particles rapidly bond together to form an ice matrix that delimits pores filled with humid air and, in the case of wet snow, with liquid water. Snow thus belongs to the large family of porous media, which also includes soils. For seasonal snow covers, snow porosity generally ranges between 40% and 98%. Because of the high activity of water thermodynamics around the triple point, the solid matrix of snow is continuously and sometimes rapidly evolving, which makes snow a unique and complex component of the earth's surface. Independent of porosity, the snow texture (or the size, shape, and distribution of the grains) affects most physical and mechanical properties of snow. The ice matrix undergoes metamorphism in response to thermodynamic stresses among the water phases and continuously evolves towards mechanical equilibrium (Laplace equation) and phase equilibrium (Clausius-Clapeyron and Gibbs-Duhem equations). 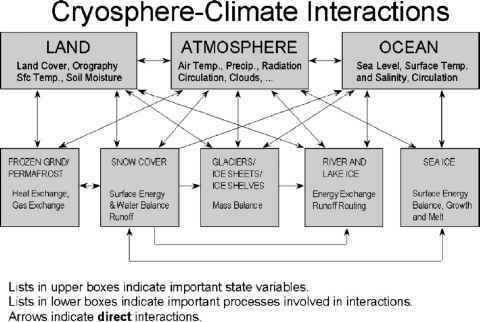 Activity in snow is enhanced by the large specific area of the ice/air interface, which also explains why snow is usually saturated with vapor. Microscopic variations in curvature and temperature induce local pressure gradients that cause vapor to sublimate from highly convex or warmer surfaces and condense on less convex or colder surfaces. Deposition of vapor causes rounding of snow grains over time and the growth of larger grains and bonds at the expense of smaller grains and fine structure. Recent research suggests that other mechanisms, such as bulk diffusion from the grain boundaries to the ice surfaces, play a role in bond growth. When the temperature gradient exceeds about 5 °Cm-1, this equilibrium growth form is superseded by the kinetic growth of colder ice surfaces to form facets and even strias. In highly wetted snow or slush, the melting point temperature is lower for less convex surfaces. Under these conditions, refreezing of meltwater from smaller grains onto larger grains results in rapid coarsening of the snow. Both diffusive and advective processes transport heat through the snowpack. In the absence of fluid flow (air or water), heat flow is linearly related to the temperature gradient, where the coefficient of proportionality is thermal conductivity. Measurements of thermal conductivity include the effects of heat conduction through connected grains and through the air space, along with the "hand-to-hand" transport of latent heat by water vapor. Snow thermal conductivity and specific heat depend primarily upon the geometry of the ice matrix and thus vary an order of magnitude over time with snow textural changes. The most useful estimates to date of the thermal properties of snow are based on macroscopic measurements of the aggregate that are then correlated to the snow type and physical characteristics such as density and temperature. As difficulties in characterizing snow microstructure and geometry are overcome, inclusion of these more fundamental properties should improve the parameterizations. Growing evidence suggests that high winds advect air through the upper snowpack, which may explain why high effective thermal conductivities are required to match observed heat transport in windy, polar regions. While high porosity and low thermal conductivity make snow a protective blanket against extreme cold, this same openness makes snow quite permeable to flows of air and water. Fluid flow through snow is similar to that through other granular materials, but is complicated by freeze/thaw effects, metamorphism of the ice matrix, and the layered nature of snow covers. Unlike soils, snow is sufficiently open to allow the movement of air in the interstitial pore space. Flow of air or water through snow is sufficiently slow that Darcy's law applies. In this case, the fluid velocity relates linearly to combined pressure and gravitational forces, where the coefficient of proportionality is the saturated or intrinsic permeability divided by the fluid viscosity. Intrinsic permeability varies widely with snow type, ranging about two orders of magnitude between fine-grained, wind-packed snow and large-grained depth hoar. It depends on the square of grain size and, to a lesser extent, on porosity. For a given porosity and grain dimension, particle shapes with a larger surface-to-volume ratio exert a higher drag on fluids. Forced interstitial air flow is known as ventilation or windpumping. Wind-induced turbulence in the surface boundary layer causes high-frequency pressure fluctuations that propagate millimeters or centimeters into the snow. The "form drag" pressure differences, caused by air flow over rough surface features, can cause stronger and more sustained air flow deeper within the snow. Only in very high permeability snow, such as depth hoar with no intervening layers, does buoyancy-induced natural convection occur. Both natural and forced convection accelerate the transport of water vapor and chemical species through snow and firn. In unsaturated wet snow, both air and water share the pore space and interfacial tensions between the two phases arise. Because of the open pore structure and coarse texture, however, gravitational forces dominate capillary forces during water flow. A gravitational solution is therefore often used to describe water flow through snow, which produces a front with the shape of a shock wave or step function. Because capillary suction accelerates water movement into the snowpack, the gravitational approximation will somewhat underpredict the wave velocity in homogeneous snow, but the effect is minor. Capillary forces do, however, play an important role in the formation of capillary barriers and flow fingers and in the upwards wicking of ponded water. Low-viscosity wetting fluids (such as water) develop flow instabilities and thus infiltration often occurs in preferential flow channels, or flow fingers, rather than as an even wetting front. The effect is particularly noticeable in mid-winter rain-on-snow events or during early season melting, when preferential flow reaches the snow base ahead of the background wetting front. Once heavy melting has ripened the snowpack, however, outflow predictions with the even wetting approach are probably adequate. Stratigraphic inhomogenieties in permeability and capillary tension can impede and laterally divert the water flow, as well as trigger the development of flow fingers. Radiant energy incident on the earth's surface occurs principally in two broad bands: solar or shortwave radiation (0.3-2.8 pm) and thermal or longwave radiation (5-40 pm). The main feature of snow in the shortwave spectral range is its very high reflectance, especially over the visible spectrum, which explains its white color. The spectrally averaged reflectivity of solar radiation incident on snow, or snow albedo, is of major importance to climate change. 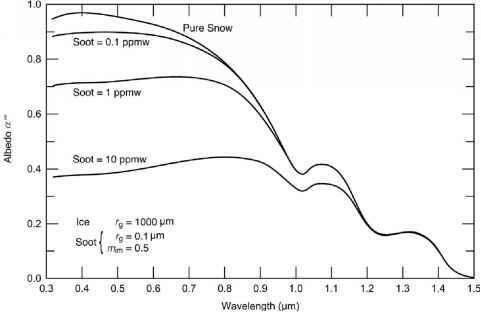 Snow albedo ranges between about 0.50 and 0.90, and decreases with grain size, the angle of solar incidence, impurities, and the ratio of direct to diffuse sunlight. Snow albedo is thus higher for new snow and under cloudy skies or when the sun is at a low angle in the sky. According to the relative isotropy of the orientation of ice/air interfaces in snow, shortwave radiation reflected by snow is diffuse and relatively isotropic. Bi-directional effects are sensitive only at high angles of incidence and are more pronounced in the near-infrared spectrum than in the visible spectrum. Nevertheless, bi-directional reflectance is important and warrants further attention in snow models. In the thermal spectrum (5-40 pm), snow behaves almost as a perfect black body and absorbs and re-emits over 97% of incident longwave radiation within the first millimeters of snow. Emitted radiation is proportional to the fourth power of the surface temperature. Snow emissivity decreases slightly for shallow angles of incidence. Because of the partial transparency of snow in the shortwave spectrum, significant solar energy penetrates up to 10 cm depth in the snowpack. Subsurface solar penetration is quite important for the snow ecosystem. Snow models to date are mostly one dimensional and their parameterizations depend heavily on aggregate properties, such as snow porosity. Current trends in research towards a better understanding of both micro- and large-scale behavior should lead to more physically based parameterizations for these models. Continued efforts to replace empirically based, and therefore regional, parameterizations with physically based parameterizations will greatly benefit global climate models. Where are there no albedo values in the winter?